The drone industry has gone through a lot in 2016. From monumental new rules and regulations, to more advanced drone models than we have ever seen, to fantastic new software and services — this industry is evolving rapidly. It’s an awesome time to be involved in drones. Through all of this, it has been the many drone blogs and websites who have kept us up to date, broke down the features and uses of new drone models, and made what’s happening in the drone world relevant to pilots across the planet. The drone blogs in this list are some of the best publishers in the industry. To highlight their work, here are 70 drone blogs for you to follow in 2017. You will be sure to find some old favorites, but keep a look out for new or upcoming blogs to watch out for as their audiences grow. Note: The blogs are listed in no particular order. Note: Check out the DBM blog here. DRONELIFE is one of the most popular and professional blogs in the industry. They write quality news articles about the top stories, new drone models, industry analysis, and regulatory updates pilots care about. They also put together Job For Drones, a service that connects professional pilots with companies seeking aerial services. Drone Flyers is a multirotor resource site ran by Craig Issod. He helps beginner and intermediate pilots buy and fly quadcopters and other multirotors. He gives advice on mini drones that go for around $20 up to prosumer models that go for around $3,000. Using his experience and technical knowledge, Craig provides invaluable resources for new and veteran pilots to take advantage of. UAV Coach has quickly grown into one of the top online drone communities (35,000+ enthusiasts). Apart from their excellent blog, which hosts news stories, product reviews, and industry commentary, they offer a growing library of online training programs for drone pilots. UAV Coach is on many “favorites” lists across the web. 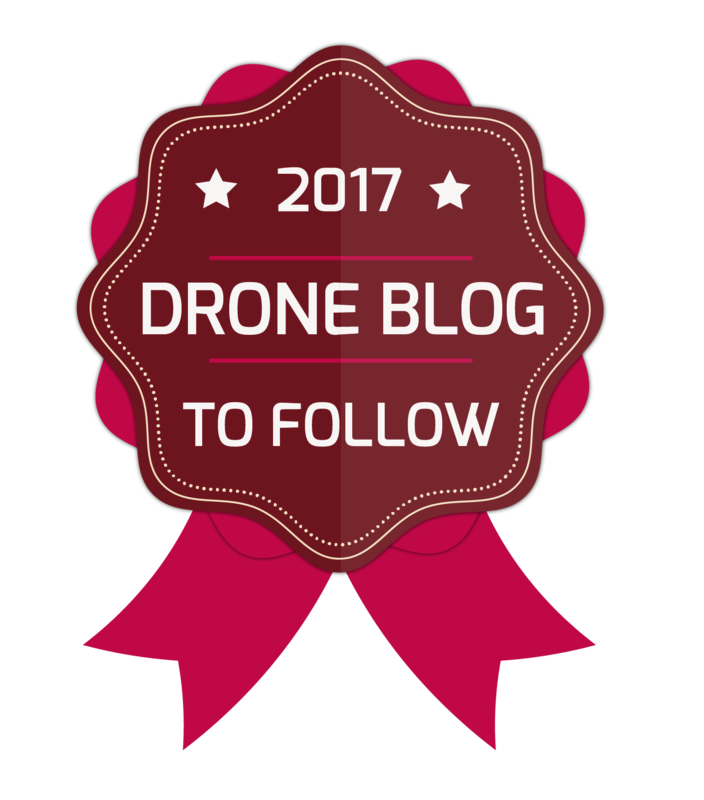 They are definitely a blog to follow in 2017.
sUAS News is widely regarded as the best news resource for small UAV enthusiasts and professionals. Gary Mortimer spearheads the publication using his wealth of knowledge in aeronautics, multirotors, and a keen journalistic prowess. Personal Drones has been around since August 2013, and it’s a great resource for consumer drone news, reviews, and updates. They feature self-published work, as well as guest articles from industry experts. If you’re looking for updates on the latest models, advice on which drones to buy, and multirotor news in general, check out Personal Drones. From Where I Drone is a fantastic drone blog for all types of drone enthusiasts, but especially for pilots interested in aerial photography and videography. Dirk Dallas is a great drone photographer who really knows his stuff. Check out his blog for photography and cinematography tips, inspiration, buyer’s guides, and much more. My First Drone was one of the first kids on the block, providing some of the highest quality drone (and drone accessory) reviews around. They have continued that trend as new models and features have rolled out. They also feature guides on building and flying quadcopters. Dronethusiast is a great blog for all types of drone pilots to follow. Not only do they publish product reviews, industry news, drone videos, tutorials, and tips and tricks, but they also take a deep dive into FPV systems. With a clean layout as well, this blog has a homely feel that makes you want to stick around. The Small UAV Coalition is a partnership between consumer and technology companies who believe that U.S. leadership in the research, development, production, and application of unmanned aerial vehicles (UAVs) will benefit consumers in all walks of life. They support and advocate for many law and policy changes that will help progress UAV applications in society. As an authority in the space, their blog syndicates the most influential articles and news from the top publications covering the drone industry. It’s a one-stop-shop to keep up to date with industry happenings and headlines. Droneblog is an awesome place to catch up on everything drone-related. They feature the widest array of article topics I’ve seen in the industry, and they also bring on a ton of writers to provide different perspectives and advice for their readers. Drone Girl is run by Sally French, a journalist and self-proclaimed “geek girl” who loves drones. Her work has been published in many major news outlets, including The Wall Street Journal, MarketWatch, NPR, CNN, and Forbes, and her blog provides a nice balance of advice, news updates, and features of new and amazing drone applications in society. If you’re interested in the evolution of drones and their uses, and you want a fresh, professional outlook on the industry, check out Sally’s blog. Quadcopter Flyers is an excellent resource for quadcopter and other multirotor tutorials and reviews. What sets them apart is the shear amount of drones they cover, including the latest models from almost every manufacturer. It’s a great source for pilots looking to expand their fleet of drones. DroneBly is an all-in-one site for drone hobbyists. They showcase flying tutorials, tips to get the most out of your drone, reviews of different models and accessories, news, videos, and other cool resources. It’s a well-designed site that makes it easy for drone enthusiasts to find what they’re looking for. Oscar Liang’s blog is perfect for the DIY drone builder and operator. He has some of the sharpest technical drone knowledge I’ve seen online. Oscar’s blog is a must-read, especially if you’re into FPV drone racing. QuadHangar is chock full of detailed, in-depth buyer’s guides for different drone models. If you have been stuck on which drone to buy for what purpose, they probably have an article that will help you make the right decision. Unmanned Systems Technology helps pilots find suppliers of unmanned systems, subsystems, software and components across a range of applications, and their blog is one of the best resources for commercial UAV industry news and events. It’s a great read for people who are interested in where this technology is going. DIY Drones was started by Chris Anderson, the CEO of 3D Robotics. It’s a massive online community discussing and breaking down unmanned systems. Their blog features posts (written by community members, DIY Drones team members, and Chris himself) with questions, builds, and insights into drone technology. Know Before You Fly is an excellent educational campaign that promotes the safe and responsible operation of unmanned aircraft systems. Their blog is a must-read for all drone pilots, as it covers the latest safety information, guidelines, and suggestions for UAS operation. They also cover important regulatory changes. The Drone Analyst team conducts research studies and market analytics to help drone companies make smarter investment decisions. Their blog offers a ton of useful insight behind this data, along with expert commentary on the commercial side of the drone industry. AUVSI (Association for Unmanned Vehicle Systems International) is the World’s largest nonprofit organization devoted to advancing the unmanned systems and robotics community. On their blog, they give readers detailed, professional accounts of what’s happening in the unmanned systems market. It’s a great site to frequent if you’re curious about the evolution of the industry as a whole. Quadcopter HQ is an informative website on quadcopters and drones in general. They write in-depth product reviews and tutorials, along with a nice guide on using drones to capture aerial video. Multirotor USA publishes a wide variety of articles related to small unmanned aircraft systems, including industry news, aerial photography, cinematography, drone laws, and safety. The primary author, Anthony, builds his own multirotors and has a wealth of aviation knowledge to draw from. Skyward provides business management software for commercial drone operators, allowing them to plan and log flights, gather data, stay within regulatory requirements, and more. Their blog showcases commentary on what’s happening in the commercial drone industry and business advice for professional pilots. If you’re a professional pilot, I highly recommend trying out their software. Rotor Drone Magazine is a print and digital magazine primarily covering consumer and racing drones. On their blog, you will find reviews of the latest products, news in the drone racing world, and events going on in the industry. Quadcopter Guide offers readers a nice balance of industry news updates and reviews/tutorials on a ton of different quadcopter models. Along with the many drone models he writes about, the author has experience with nitro fuel powered planes, electric planes, and electric helicopters. DroneDeploy is an app that allows drone pilots to easily create aerial maps and 3D models. Their blog, Aerial Acuity, is a favorite among professional pilots, as it provides a ton of great insight into the commercial drone industry. Quadcopter Garage is a personal blog started by a couple drone enthusiasts. It’s a place for them to both post about their own projects and to teach people about the hobby and how to navigate it effectively. It’s a nice, down-to-earth blog for drone enthusiasts. Ready Quadcopters is one of the most popular blogs for drone reviews, tips, and tutorials. Apart from many singular articles, they also put together ultimate guides that go in-depth into a certain drone or type of drone. It’s a great site to build your quadcopter knowledge. Quadcopter 4K is a sweet blog to get your fix of awesome drone photography and videography. The site is centered around capturing aerial imagery, but you will also find drone reviews, how-to tutorials, and drone industry news. Drone Flyers provides a crazy amount of drone reviews. The author writes about drones that I’m sure most people haven’t heard of, which is great to give these manufacturers some exposure and to show pilots what other options are out there. Check out Drone Flyers if you’ve been itching to try a new rig. UAV Expert News is a personal favorite news source of mine. They send out a daily email with links to stories about the latest happenings in the industry. It’s a nice way to fit your drone news fix into your routine. UAS Magazine is one of the most professional unmanned systems publications on the web. They took traditional magazine and news-style editorial standards and applied it to the drone industry. UAS Magazine is a great resource for staying informed and learning about new opportunities in the space. Drones Magazine is another great website for building and maintaining your drone knowledge. Their articles are expertly written on a wide range of subjects, from new releases, to product reviews, to how-to tutorials and drone laws. DroneAbove is run by Justin Edwards, a drone pilot who wants “to push the boundaries of action drone photography.” Using his genuine interest in drone technology and helping people, Justin writes fantastic blog posts on the ins and outs of flying a drone, capturing images/video, and his own projects. Unmanned Aerial Online is a solid drone publication. They cover the expanding drone applications and evolution of this technology in both the commercial and civil aerial vehicle sectors. If you’re looking for expert analysis and thought leadership, make sure to give them a read. Drone RSS syndicates articles from a ton of different blogs in the industry. It’s a cool site to get a lot of information on the drone industry in one place. Drone Buffs is a top-notch blog featuring news and interesting information within the drone world. You will find articles on aerial photography, drone racing, tips, videos, and even drone stunts. The content here is unique and fun to read. Drone law is a hot topic in the industry, and for good reason. It affects everything we do with our UAVs. Drone Laws Blog is run by Jeffrey Antonelli, a lawyer who specializes in the legal side of drones. Read his blog to make sense of the laws surrounding sUAS in the U.S. The UAV Digest is a fantastic drone podcast. They put out weekly interviews, news updates, and commentary on the drone industry, and they cover both the recreational and commercial sides. The hosts, David Vanderhoof and Max Flight, also put a big emphasis on the ever-expanding applications for UAS. You can’t go wrong with a weekly dose of this podcast. That Flying Thing is a great up and coming drone blog offering tutorials, news, and product reviews. Anthony L, the blog’s creator and primary author, writes well-thought out articles that provide a ton of value to his readers. If you’re looking for tips on both ready-to-fly rigs and DIY, check out That Flying Thing. Urban Drones is a popular online drone retailer that runs a great blog for drone enthusiasts. They cater really well to hobbyist flyers and professional pilots, and it’s obvious that they put a lot of time and effort into their content. Do you live that drone lifestyle? If you do, you should check out Drone Lifestyle, a nice blog run by three friends, Chase, Chris, and Michael. It’s clean and easy to navigate, and their information is top-notch. You will find reviews, in-depth tutorials, cool videos, and a whole lot more. DroneBuff is a watering hole of drone information. This blog is PACKED with content ranging from drone reviews, to aerial photos and videos, to in-depth guides and tutorials. DroneBuff is a must-read for new and veteran pilots alike. Drone Coalition is one of the most professional online drone publications around. Their contributors include many experts in the drone industry who bring you news and commentary on hot topics in the space. Andrew Nixon runs Best Drone for the Job, a blog that’s jam packed with awesome drone reviews. What makes his reviews unique are that many are job-specific or for specific purposes. So if you’ve been struggling to find a rig to suit your purposes, Andrew might have a review for you. Inside Unmanned Systems is a great blog for commercial drone news and resources. Their articles are in-depth and professional, and they know what they’re talking about when it comes to the business side of the drone industry. Drone Journalism Lab is run by Matt Waite, a professor at University of Nebraska-Lincoln’s College of Journalism and Mass Communications. His blog features interesting links, thoughts, and research into using drones for journalism. If you’re interested in the use of drones for journalism (and there is a strong case for it), check out Matt’s blog for expert insight into this application. Tom’s Tech Time is one of the most interesting drone blogs I’ve come across. It’s run by Tom David Frey, a drone enthusiast and aerial photographer/videographer. He provides a ton of extremely high quality tutorials to help improve your skills and reviews of different products. His blog is also a place to showcase his work. Drone Uplift is a super cool blog. It is full of product reviews, from the most popular drones all the way down to specific parts and accessories. They also comment on industry news and put together tips and tutorials. DroneZon is an old favorite that has been around for some time now. It is constantly updated with aerial photography/videography tips, news about drone technology, drone reviews, and drone videos. The author, Fintan Corrigan, has a wealth of UAV knowledge to share. DroneShift offers many useful reviews and tutorials on a variety of drone models and accessories. The author, A.J., also provides access to ask him any questions you might have through his “Ask A.J.” page, which is a nice way to get help directly from the source. FPV blog is an extremely good blog for first person view information. The author has a deep technical knowledge about FPV systems and drone racing. There is still a lot of misinformation (and a lack of beginner’s guides) in the FPV quadcopter realm, so FPV blog is a god send for anyone looking to get into first person view flight and racing. UAVwire curates articles from across the drone industry. The site focuses heavily on news updates, so it’s a great place to stay up to date on what’s happening in the drone world. Quadcopter Blog is a nice blog for reviews and tutorials on just about every quadcopter out there. In total, they write about 20 different categories of drones and drone types, so if you’re interested in a specific type (or types) of quadcopter, you will likely find a review for it here. theUAVguy is run by Iain Butler, one of the foremost and most recognizable bloggers in the industry. He writes about new develops in the drone space, how it is growing, and the applications for UAVs in society. His blog is an amazing resource for detailed descriptions and commentary on different aspects of the drone industry. Drone Supremacy is a cool blog that’s relatively new to the scene. It features a lot of great buying guides, reviews, interviews, and interesting takes on different drone models. Drone Definition is an interesting blog that’s centered around providing a meaning for drones in our society and the news related to this industry. Apart from commercial drones, Drone Definition also touches on military drones, safety, and law enforcement drones. It’s a nice site to get a different perspective. Drone 55 provides aerial photography, cinematography, and data services. Their blog is a great read for commercial pilots and clients who are interested in drone services, because it covers a host of topics that both parties would be interested in. Drone Vibes is a podcast that covers everything to do with the drone industry. They feature interviews, event summaries, reviews of different products and software, and a ton of other useful insight into everything drone-related. Jamie Brightmore is a professional filmmaker who takes excellent drone photography and video. His blog provides a fun combination of drone industry commentary, showcases of his work, tech commentary, and more. Make sure to check out his work if you’re looking for inspiration. Awesome Drones is a well-designed site that hosts a lot of great drone reviews, commentary on different aspects of drone flight, and tutorials for beginner pilots. Give it a read if you’re interested in different perspectives on drone models and other drone-related topics. Drone360 is an excellent magazine covering the drone industry. They feature articles on rules and regulations, product reviews, news updates, commercial applications, drone business, and the hobby side of the industry. Their interviews are also top-notch. Buy The Best Drone is one of the most comprehensive sites for drone and drone accessory reviews. You will find a ton of product-specific reviews as well as general reviews of drones for different purposes. They also offer professional drone services. Dronestagram is a drone photography social network. People can post up news, tips, tricks, and showcase their aerial photography work. They host regular contests and showcase events. If you’re into drone photography, check out Dronestagram. DroneBlog.co.uk is a cool blog for drone enthusiasts. Apart from product reviews and tutorials, they provide general knowledge articles on navigating the drone industry and making sense of UK drone regulations. RC Crunch is a neat site for drone and other RC-related content. It’s one of the few RC sites with a heavy emphasis on drones, so if you’re into other types of remote control aircraft, RC Crunch may have the content you’re looking for in one place. Phantom-Four.com is a blog dedicated to the DJI Phantom 4 and other DJI drone models. This site is great for DJI fans and pilots. Drone Law is a Tumblr blog that hosts a ton of insight into drone laws in the U.S. They provide a nice combination of commentary and links to the latest news updates and resources on the legal side of drones. The Center for the Study of the Drone is a subset of Bard College dedicated to studying drones. They send out a weekly roundup that curates some of the hottest stories and updates in the drone industry, including fixed wing, commercial, and military drones. Sometimes, the easiest and most cost effective way to buy your drone and necessary accessories is through a kit. Best Quadcopter Kits reviews many different kits and breaks down what’s inside and their pros/cons. It’s a good site to check out if you’re looking for all-in-one packages. Thank you to all of the great blogs that have consistently provided the drone industry with a ton of value and relevance. What are your favorite drone blogs and publications? Any that I missed? My Drone Choice — A well-designed blog filled with good drone reviews. That sure is a terrific list of drone blogs. So much knowledge to be found in them. Thanks Fintan. Keep up the good work at DroneZon! It looks like our community is growing fast, that’s good to see. Such a great list for somebody like me who has an online shop for drones. I am reading blogs a lot especially to follow recent reviews before selling products. Thank you! I have found inspirational photography and some good articles, this was the first blog I follow until now that I am seeing al your recommendations, thnks a lot Hi from Honduras! Hey Michael, awesome list! It’s such a useful resource, having most of the relevant quadcopter blogs in one place. Great list, if you do update it consider adding https://drones101.net. It’s a blog I recently started to help get people who are interested in drones but haven’t taken the plunge yet introduced to everything they need to know about drones. Thanks for this list, its been very helpful in my research. Hope you can consider my site as well! I think I commented on your Facebook page but I’d add Drone360 (disclaimer, I contribute) and From Where I Drone (http://fromwhereidrone.com). Hi Kara. Drone360 is featured (#62), and I totally agree with From Where I Drone. I’m having some styling issues with the page but will be adding him in once that’s sorted out. Great list of drone related blogs. Thanks for putting this up together. My blog is a drone blog, too; can you add my blog on this list? I have a drone blog and I think your readers would love some of my content. My blog is all about monetizing drones, marketing, and starting your own drone business. I would love to guest post on your blog. Let me know what you think! Very nice list, a lot in there I haven’t seen before. A couple of them aren’t being updated anymore, and one of them isn’t there anymore at all (66), says domain is for sale. Great list for browsing anyway. Wow its a huge list of some of the great blogs. Thanks for making it so easy for us. Thanks for the great links to some very interesting articles. My blog is also named “Personal Drones” but not in your list..:) Hope it is also worth including.